The 1st of January 2017 marked the 18th anniversary of the European common currency, the euro. Despite its success from 1999 to 2007, after 2008 the euro has become a burden for many of its members. For example, living standards in Italy and Greece are below the levels when they joined the euro. Finland is the only Nordic country using the euro and it is also the only Nordic country which has not yet recovered from the financial crash of 2008. There have been many proposals on how to fix the euro and the EMU, but they are politically unpopular and unrealistic. In this blog-entry, we will argue that the euro will almost surely fail; we just do not know the exact timing of its demise. 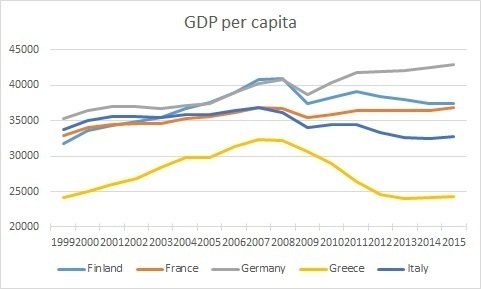 The problem of the euro can be visualized in the development of the GDP per capita. Germany has been successful in the Eurozone, while Greece and Italy have not. France is not doing well either. The jury is still out for Finland. The different growth paths are a symptom of a general problem that has haunted currency unions for centuries. Competitiveness and productivity develop at a different pace in different countries. Over time, this leads to large competitiveness differences among the members of a currency union. These differences do not usually pose a problem during economic booms because strengthening aggregate demand supports ailing fields of production. However, when a currency union faces an economic downturn or a crisis, falling aggregate demand hits less competitive industries and countries hard and the financing costs of less competitive countries jump. This is an asymmetric shock. The detrimental effects of asymmetric shocks can be mitigated by transferring funds from prosperous to declining member states. When the dollar union of the US threatened to fall apart during the Great Depression, the federal government enacted federal income transfers from prosperous states to aid ailing ones. The federal budget also increased rapidly and, in practice, income transfers became permanent. The no bailout policy of crisis-hit states had already been enacted earlier. According to the ECB, competitiveness of the German economy has improved by around 19.3 percent, Greece’s competitiveness has improved by around 6.5 percent, France’s around 3.9 percent, Finland’s around 1.7 percent and Italy’s around 0.9 percent since 1999. Thus, for survival in its present form and size, the Eurozone needs a similar income transfer system, that is, a full political union as in the US. There is no European-wide polling data on a political union, but it appears that the support for the EU is diminishing in its core. In a recent survey, 40 percent of Finns wanted to leave the EU. Also, only 53 percent of Dutch are against a new referendum on the EU, which means that 47 percent are either for it or do not know their stand. For permanent income transfers, you would need to change the Maastricht Treaty and ratify it in each member country or to negotiate several bilateral agreements. There is only a very small likelihood that these would go through, for example, in Finland and in the Netherlands. Because there is no public support for a federal European Union, many have envisaged alternative ways to fix the euro. The CEO of the European Stability Mechanism (ESM) Klaus Regling has proposed that euro could be saved by a combination of the banking and capital market union and a rainy day fund. This fund would allegedly be used when asymmetric shocks occur. The fund would be financed jointly by all euro countries. However, because of the persistent differences in competitiveness, its transfers would become permanent. Only the most competitive members of the Eurozone would have sufficient income to finance the fund. Any financing through the European Central Bank (ECB), would need to be covered by European tax-payers later when it would become evident that weaker countries are unable to pay back their loans and when seigniorage revenues would be unable to cover the losses of the ECB. Thus, in practice, there are only two ways to fix the euro: A far-reaching political union proposed in the Five President’s report in 2015 or returning to the system described in the Maastricht Treaty, where member states would be responsible for their own economies only (no bail-out). In a full political union, there would be a concentration of economic policy decision-making and it would require major structural changes in the Eurozone and its member countries. Tax and social policies would be unified, labor unions would be dismantled or unified as a European-wide system, a European debt relief system and banking union would be set up. These would ensure the flexibility of wages, prices, and labor agreements and guarantee convergence of competitiveness and living standards. This could work, in theory. But, the likelihood of getting all the member states to agree that their wages, debt and living conditions would be negotiated at the European level is extremely small. Returning to the Maastricht Treaty and to the no bail-out rule would mean that persistent differences in living standards and market-based debt restructurings would be enacted. ESM and the European Financial Stability Facility would be wound down after their current programs would end. ECB support (QE and OMT) programs would stop. This would lead to the default of Greece and its likely exit from the euro. In the long-run, asymmetric shocks and persistent income differences would be likely to force several additional countries to leave the euro. The Eurozone is in a stalemate. A federal union would be needed to fix its problems, but there is no public support for it. Returning to national fiscal responsibility would lead to defaults and exits. Half-way solutions will prove insufficient but expensive and obfuscate the issues. Therefore, there may be no way to avert the partial or complete break-up of the Eurozone in the years to come. The fate of the euro may already have been sealed. Tuomas Malinen, CEO of GnS Economics, postdoctoral researcher at the University of Helsinki, co-written with Dr. Heikki Koskenkylä and Dr. Peter Nyberg. We look forward to your report on report on how Finland could best leave the eurozone.